When the need arises for a healthcare system to expand its real estate, realign its programmatic adjacencies or analyze its lack of available land for expansion, the ensuing conversations may trigger the question of whether a facility’s vertical expansion is feasible. While many have planned in advance for an overbuild project, others have not and may find themselves trying to make the most informed decision at the earliest of stages of strategic development. You can never ask enough questions. That said, what are some of the key architectural, construction and operational issues to consider when deciding whether to vertically expand a facility? Whether the project site is an urban infill overbuild or on a suburban campus, carefully planned site logistics are critical to the success of the project. Where is the crane located, and what is the swing direction? Will the crane need to be moved multiple times? The project will have contractors who need to access the site, so where will they park? Can you create temporary parking areas on site, so that you don’t stretch campus-parking capacity too thin? Materials will need to be delivered, and lay down area for staging will have to be identified. If there is limited space on site, consider just in-time delivery and sequencing. Will the project require personnel and material lifts? What will be their location relative to existing operational facilities? It’s important to consider how construction activities will affect the existing vehicular circulation patterns. Can you develop a plan to ensure that there is clear separation between construction activities and service deliveries, emergency vehicle traffic and visitor, patient and staff traffic? During construction, will there be any work to underground utilities or new routing that will require roadway shutdowns or temporary detouring? New construction will trigger a series of code issues to consider. Will the vertical expansion have a different occupancy than the spaces below? An example would be building an I-2 over an existing B Occupancy, which would require horizontal fire separation considerations. Additionally, vertical expansion has the potential to modify or change compartmentalization. Where is the new structure going relative to adjacent structures of similar height? What are the fire separation distance requirements, and are there any issues with protective openings of occupied spaces. Will the new construction exceed specific heights, triggering a change to a high-rise condition? If so, thinking through the additional requirements for fire pump capacity, tank location and access will be important. What impact will the additional square footage have on parking count and capacity? Can you plan for this additional volume? Calculating egress capacities and widths early on is important. How will the additional continuous area affect existing stair and door widths and will modification be required? Will the new project require the construction of an additional stair? One of the first questions to ask is whether the building to be overbuilt was structurally planned and designed for vertical expansion. Are the columns, lateral system and footings designed for the added capacity? If not, reinforcing or adding new structure are options that both require work in spaces below to modify the structure. Is there an opportunity to hang or suspend the structure from above from both a building expansion and seismic control perspective? What are the roof conditions? Is there an existing slab and will it have enough capacity to support both the new building structure and programmatic requirements? Is the roof level or will there need to be modifications to the slab? If the overbuild project is adjacent to other roof structures, will there be new drift loads to consider, which could trigger reinforcement of the adjacent structure’s roof? If built over multiple buildings, they may have varying structural capacities and fire rating differences. Lastly, is the project going to want to match existing or adjacent buildings floor-to-floor heights? Are they adequate for the new program type? Changes to the length of stair runs due to increased floor-to-floor heights may complicate stacking on existing stairs. If building the project over operational space, all the MEP work will need to be carefully coordinated to maintain services to the programs below. One of the first things to consider is the adequacy of the building services. Will the vertical expansion require additional capacity? Will the capacity come from new equipment dedicated to the expansion or from upgrades to existing infrastructure? Are there any roof systems that need to be enclosed or relocated? Will relocations be temporary? Will you need to reroute any infrastructure – plumbing or ductwork – on the roof while construction is underway? What will require vertical extension through the new construction? Are there exhaust or air intake shafts requiring routing to the new, higher roof? Are there any spaces with vent hoods or flues that need to remain operational and connected? Will there be a need for supplemental boosting to accommodate for additional flue heights? If extending plumbing vent stacks, teams need to coordinate the shutdown of those spaces. If the new spaces have floor drains, will tie-ins occur in the ceilings of the operational spaces below? Careful planning of headwalls, shafts and risers to stack on existing similar conditions below can lead to efficiency in sequencing construction by limiting work in operational spaces below. When working on a roof, penetrations will occur which will expose spaces below to the elements. Plan for the inevitability of water infiltration and prevent it from flowing down into the structure. 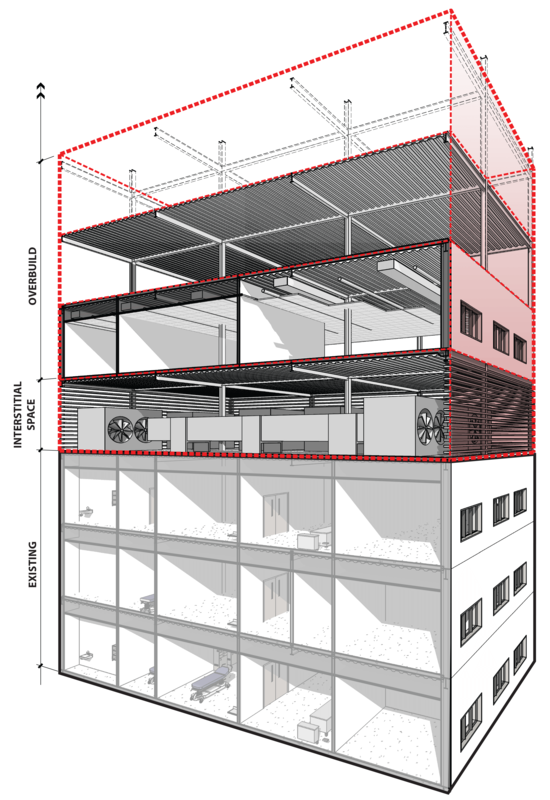 The idea of first constructing an interstitial mechanical floor between the existing building and vertical expansion can enclose and protect the spaces below from construction above. When aligning or extending the vertical walls of the building below, coordination of the coping removal and waterproofing details are critical to ensure no infiltration between the existing and new facades. Will the project look to expand the elevators and hoistways? What elevator types are in the building? Will the new overall height trigger a conversion from Hydraulic to Traction? If the plan is to replace the cabs in place, will the work occur after hours or though coordinated shutdowns? Will machine rooms require modifications, or will new rooms replace existing? If constructed with steel and there will be welding on site, life safety measures will need to be considered relative to the risk of fire from welding operations. Are there any operational spaces that are particularly sensitive to vibration adjacent to the structure? Are there any spaces that require noise mitigation considerations, such as building adjacent to patient rooms or recovery space? If the project is setting heavy steel, it should be determined if the spaces below can be decanted during this process. Additionally, consider protection of the fenestration on the building below to mitigate falling debris during construction of the new facades above. Is the construction adjacent to any air intakes for mechanical equipment or operable fenestration, and will you need to employ air quality controls? Develop a dust and dirt mitigation control plan to mitigate cross contamination of adjacent spaces, as well as think through trafficking routes for construction debris and waste removal. Some construction methodologies to consider are sequencing, timing, work hours and prefabrication to help reduce impact and schedule. Whether the decision is to attempt to match or intentionally distinguish the new overbuild facade from the building below, material selection is critical to the architectural success of the project. Unless the projects are being construction in the same technological era, the likelihood of exactly matching materials is marginal at best. Building materials are subject to the elements and inherently age with time. Masonry may not only be discolored from the original building because of dirt or organic activity, but the process by which the masonry was formed and its aggregates may be from another era. Glass manufacturers are constantly improving the specifications and performance of their coatings, so coloration and reflection may not be exact matches. Metal panels are typically painted materials, which can be subject to UV damage over time. Does the facility have a record of the specification and product submittals from the previous project? If clients desire matching, a custom process can be undertaken to modify colors during the submittal process to “match” existing. Another consideration is reclad or over clad the entire or portions of the existing building below to integrate the architecture more carefully. Will the construction activities impact egress routes? Developing interim life safety measures is important to ensure the safety of the building occupants in the spaces below. Will construction sequencing and scheduling potentially require decanting and multiple relocations? Does this require temporary signage and wayfinding to the new departments? 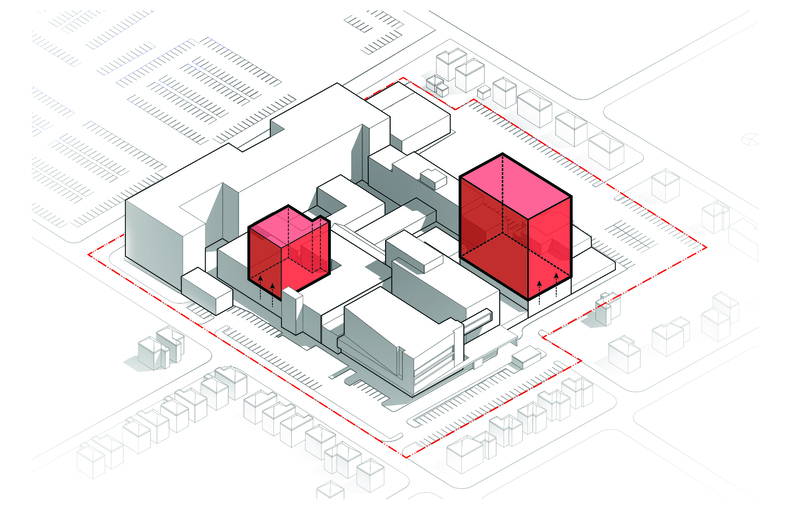 Will you plan the vertical expansion to work with the existing building circulation, or will visitors, staff and patients have to traverse through existing departments to get to a new circulation core? If the project has the potential to add new departments or create new front doors, planning and designing the future site and building circulation patterns will accommodate the ease of building navigation. 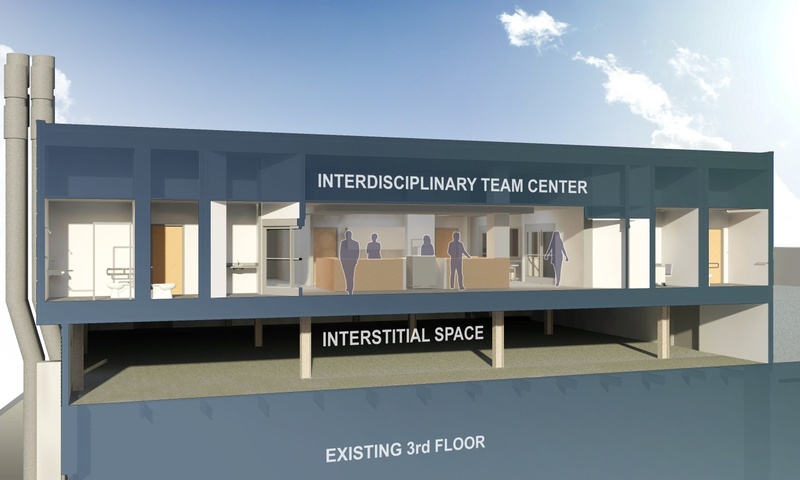 Will the new construction require work in existing departments or patient spaces? Planning and sequencing work to minimize shut downs or decanting will need to be considered. What are the infection control plans during the course of construction to ensure patient safety? Communication of daily activities between construction professionals and departmental staff is critical to the coordination. What are protocols to develop for both nuisance and emergency response? Not meant to deter vertical expansion, which can be an exciting project, these questions are considerations for when extending a project vertically is the best solution to campus expansion. A lot goes into floors and program properly and optimally adding to any building. Putting together the right team of structural experts, skilled infrastructure system personnel and a design team who have asked and answered these questions for other healthcare systems is key to achieving the optimal building – optimal from an ROI point-of-view and one that is both patient-focused and scores high in staff satisfaction.